Place of Origin: Indo-West Pacific: Andaman Islands to Philippines and Indonesia. 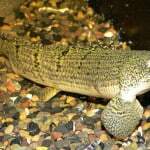 It inhabits river estuaries and coastal areas, brackish conditions. 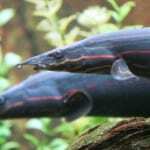 Typical Tank setup: The Gymnothorax Tile are easily stressed if not the right environment is provided. The most important part of creating this environment is to create a lot of hiding places for the eel like caves. It’s essential that the aquarium bottom is covered in sand as the fish often spend time burrowed into the substrate. 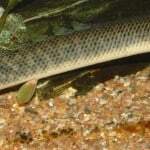 Gravel is not recommended as its sharp edges can damage the eel’s skin. The tank cover must fit very tightly and be suitably heavy, or the eel will be escaping. 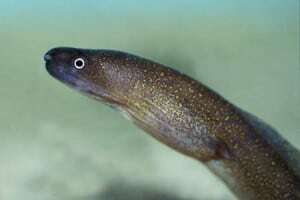 Compatibility: The Gymnothorax Tile likes to feed on fish by nature but will not usually attack any fish too large to be considered food. Given the adult size however, tank mates should be chosen very carefully. It is very happy in the company of its own kind and is often more confident and outgoing when kept in this way. A group of these kept in a suitably large tank makes a spectacular sight. Feeding: They are considered a tricky species to get feeding in captivity but in reality not too hard if its basic requirements are met. 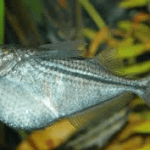 When kept in freshwater it is generally far more difficult to induce to feed than if maintained under brackish or marine conditions. They may only show interest in live foods such as river shrimp initially, but will usually adapt to dead eventually. Prawns and white fish such as lance fish are the preferred foods, but they will also take earthworms, mussel and other meaty foods. Dried foods are rarely if ever accepted. 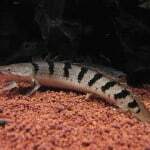 Additional Information: The Gymnothorax Tile is usually sold as a freshwater species. However all members of the family Muraenidae require the addition of marine salt to their water, with most needing full marine conditions. Gymnothorax Tile will survive in freshwater especially when young, but it will eat and grow far better in brackish conditions. 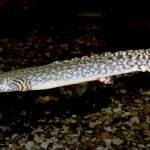 Keeping it in this way will often help to eliminate the problems with feeding, and almost certainly increase the survival rate, two issues that have earned this eel a reputation of being difficult to keep in aquaria. The level of salt should also be increased as it grows, as in nature it exists in full marine conditions when mature. Extreme care must be exercised when performing tank maintenance or moving moray eels. They have a mouth full of needle-like teeth and carry a nasty bite, along with a horrible tendency to suddenly lash out at an unsuspecting hand or arm. A final point to note is that you should never add copper-based medications of any sort to an aquarium containing this species, as it is particularly intolerant of them and may be killed. 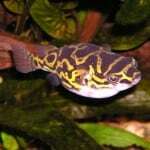 This entry was posted in Profiles Tropical All Fish, Profiles Tropical Brackish, Profiles Tropical Oddballs. 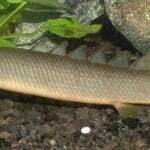 Fish were the first vertebrates with bony skeletons to appear on Earth. Unlike today’s fish, early fish had no scales, fins, or jawbone, but they did have a dorsal fin.